"In the late ’60s I began hearing about a mysterious varietal called Zinfandel. No one knew the grape's origins...."
Who would have thought there would ever be two successful movies about American wine? But following on the heels of Sideways (based on Merlot-tasting in Santa Barbara wine country), comes Bottle Shock, a critically acclaimed comedy based on George Taber's book Judgment of Paris: California Vs. France and the Historic 1976 Paris Tasting That Revolutionized Wine. Any time I need a reality check on just how damn old I am, I can always think back to 1959, when I was in graduate school at Stanford, drinking raw, cheap "Mountain Red," purchased by the gallon at an outlet store on El Camino Real. "Jug wine" came in red and white, although the name on the jug was usually "Burgundy" or "Chablis." While there were a few vineyards selling better quality table wines in the ’50s, single bottles made up just one percent of California's output. The Gallo brothers had contracts with vineyards all over the state; even the older Napa vintners like Almaden sold 80 percent of their wine to Gallo, which was then all mixed together and bottled. Jug wine was $2, but the white was sour and the red harsh. A common solution was to mix with 7-Up, making a "wine cooler." Gallo were expert marketers, and this did not escape their notice: They mixed fortified wine with lemonade, creating "Thunderbird." My introduction to New York wine was no more impressive. New York State wines were far worse than California's, and French wines were astronomical -- $10 and up, enough for two entire meals out. But then I went to work as secretary to a well-to-do composer and critic, Virgil Thomson. He was a Francophile, and while we did not socialize, I learned that enjoying wine was necessary to becoming a cultured person. The signal event in my education came when my girlfriend gave me a birthday present of a half-bottle of Chateau Lafite-Rothschild 1959 (cost: $17). And with that first taste I was hooked. It was soft, generous, floral to the nose and fruity to the tongue, with not a hint of alcohol -- it invited one to quaff, not cautiously sip. Like drinking pure essence of grapes. Like drinking for thirst, for pleasure, not to get high. Alas. How was I to know it was the best contemporary vintage of the best winery on the planet? It set an impossible standard. Nothing would ever be quite as good (not for several years would a wine even come close). Even if I could afford to buy wine, I knew I could never recapture that particular magic. In 1965, by now living in L.A., my then girlfriend and I drove up to Napa. This was long before "tasting" was an established vacation activity. The vineyards were marked, if at all, with crude signs: Inglenook, Wente, Schramsberg. Most weren't open to the public; you just followed Route 29, two narrow lanes, off which were many small roads. One led to Beaulieu, long a distinguished native wine (served at the White House during the Roosevelt administration). We drove down a dirt road, arriving at a shaggy nondescript house and a big corrugated shed. There was a pickup truck. No one in sight. I parked, and we got out, stiff from the journey. A crusty guy in overalls appeared. I asked, can we taste some wine? He shrugged, but led the way to the shed. From a top-load refrigerator, he pulled out a bottle, BV Cabernet Sauvignon 1961, and poured us a couple of generous slugs. It was pleasant, and we said so. We tried to be charming. He relaxed a little, and said, well, try this, it's new. George de Latour Private Reserve. It was the best domestic wine I'd ever tasted. He said it came from a special hillside plot called "Martha's Vineyard" -- the best climate, soil and drainage in the whole valley. Shortly thereafter, Beaulieu was sold to a conglomerate. The guy who'd poured our wine turned out to be Joseph Heitz, the BV winemaker, who had already started his own winery, and signed an exclusive contract with "Martha." 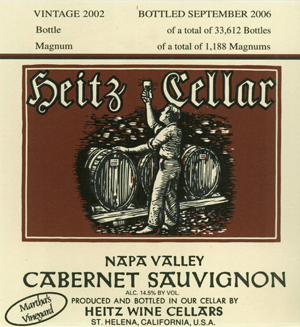 Future editions were titled "Martha's Vineyard" on the Heitz label. 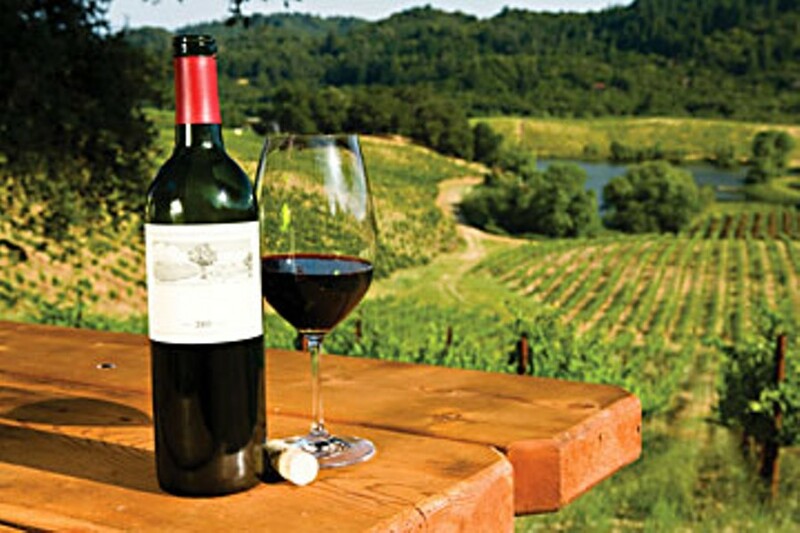 They still are among the finest California Cabernet Sauvignons, selling at $110-170 a bottle. In the late ’60s I began hearing about a mysterious varietal called Zinfandel. No one knew the grape's origins (modern DNA testing has since traced it to Southeast Europe), but it was a verdant, high-sugar-producing stock that thrived all over the state, even in the Central Valley, where it was grown as table grapes. The "mystery" for me was why anyone cared: It was alcoholic and rough, with a bitter, inky aftertaste. Spoiled as I was by having tasted two of the best wines of the century, I was not impressed with it. But then I heard about a new winery in the Santa Cruz Mountains: Ridge Vineyards. From the west, Pacific breezes moderated the heat, producing a microclimate somewhat like the Adriatic. Each release was from a specific area, emphasizing the concept of "terroir." Tasting Ridge Zinfandel wasn't like experiencing a fine Cabernet, but there were interesting fruit and spice notes, like orange and clove, and it had been aged in new oak (Cabernets were customarily aged in used French brandy casks). On a trip to San Francisco with my mate, I had a radical idea: "Let's get some good bread and the makings of a picnic, and drive down to Ridge. Maybe if we get there in time for lunch, we can get a bottle." Remember, again, that "tours" of vineyards were unknown. Individuals willing to negotiate back roads might get to a winery, but the wineries themselves were not set up for customers. There were no "tasting rooms." They often didn't even have a retail license to sell bottles. Arriving at a pleasant whitewashed house with a veranda, we were greeted by a pleasant lady, the bookkeeper. I explained that we'd brought a picnic lunch, and offered to share it. No, she said, I must be going, but let me call Paul, and see if he'd like to have lunch with you. It turned out he would. He arrived in a jeep, bearing two bottles of wine, which we shared. This was how I met Paul Draper, the legendary oenologist who perfected single-vineyard winemaking. After lunch, he directed us to follow him up the hill to the great barn, where we tasted the first of what would be a series of award-winning Cabernet Sauvignons. They (and Heitz) would figure significantly in the famous wine competition I mentioned above. But that's another story. Those days are gone. After 1976, winemaking became fashionable. Lavish chateaus were built, with retail facilities and tasting rooms. Tourism followed, and the cheap high from trundling between tasting rooms became a cliché. Naturally, the economics of hundreds of free samples made it impossible to taste really special wines. It was an innocent time, when a young couple could visit the great wineries, and come away with a magical experience. But there are such experiences today, waiting to be discovered. Look for them, and act. Seize them. Who knows when they will disappear?